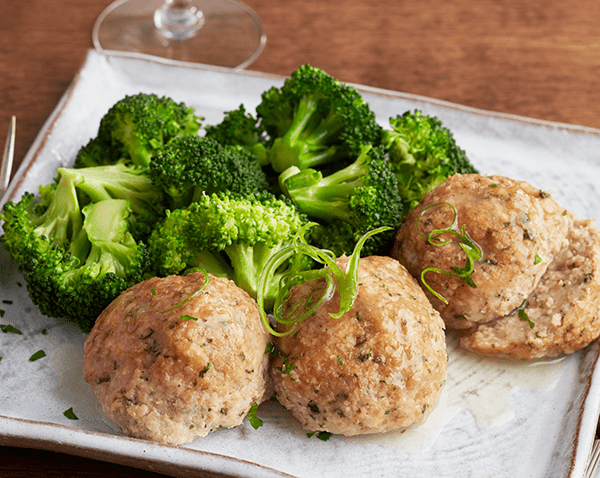 Turkey meatballs made with paleo breadcrumbs in a lemon ginger sauce. 6 oz portion. TURKEY, WATER, ONION, GLUTEN FREE BREADCRUMBS, EGG, GINGER ROOT, LEMON JUICE, GARLIC, LEMON JUICE, PARSLEY, BLACK PEPPER, WINE, ULTRA SPERCE MAIZE.